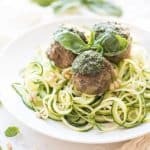 Paleo + Whole30 Pesto Meatballs Recipe – meatballs made with pesto, then topped with pesto and served on zucchini noodles. A healthy and delicious dinner recipe! Gluten free, grain free, dairy free, sugar free, clean eating, real food. I like to make ground beef at least once a week. Either these paleo + whole30 Italian meatballs or make a lettuce bun hamburger. It’s the easiest way to get my 3 year old to eat red meat since he can easily chew it. I want to make sure he’s getting his iron! After making my oh-so-very-favorite Italian meatballs, I wanted to to switch things up a bit. 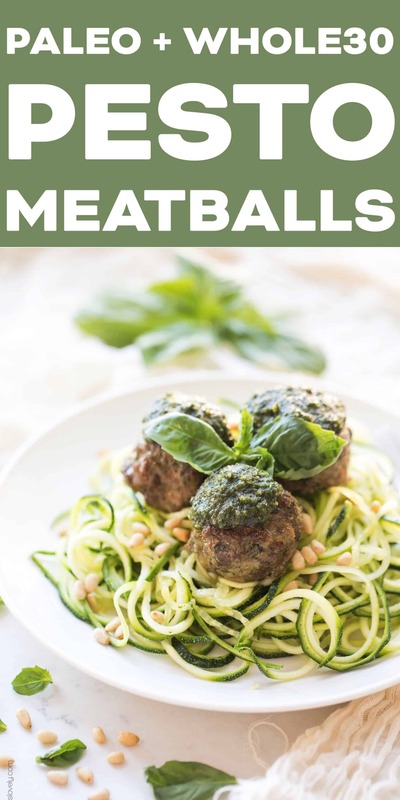 I made this pesto version, and I love these paleo + whole30 pesto meatballs just as much. Love having another option for our dinner rotation. 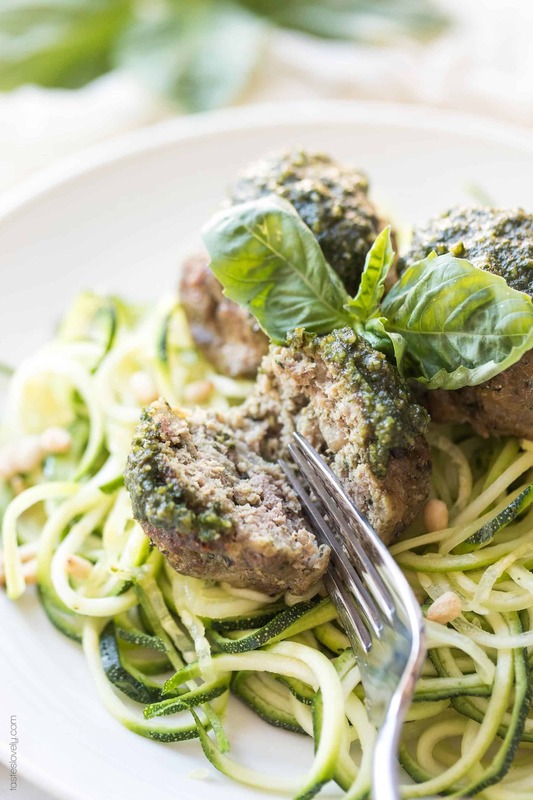 It’s the same base as the Italian meatballs, but is packed with basil flavor. I added in pesto instead of chicken stock, freshly chopped basil, and dried basil. I grow a ton of basil in my garden over the summer, and use it to make dozens of jars of my paleo + whole30 pesto that I adore. I store it in the freezer, so even in the middle of January I’m enjoying fresh basil pesto. You can get fresh basil at the store to make your own. I love that Trader Joe’s has it in stock year round. 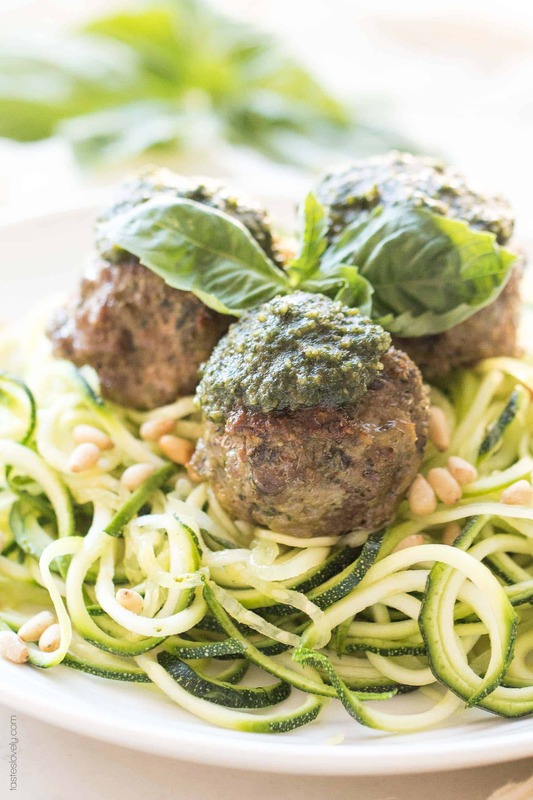 Serve the baked meatballs on top of raw zoodles or cooked spaghetti squash, and top with more pesto and some pinenuts. 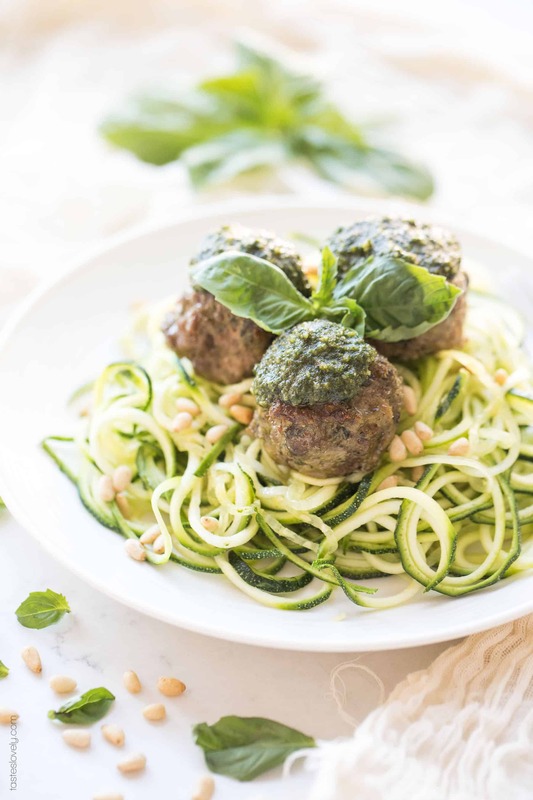 You’re going to love serving these clean eating, paleo, whole30, gluten free, grain free, sugar free, dairy free pesto meatballs to your family. Preheat oven to 425ºF. Line a large rimmed baking sheet with parchment paper or foil (for easy clean up), and place in a wire rimmed baking rack. 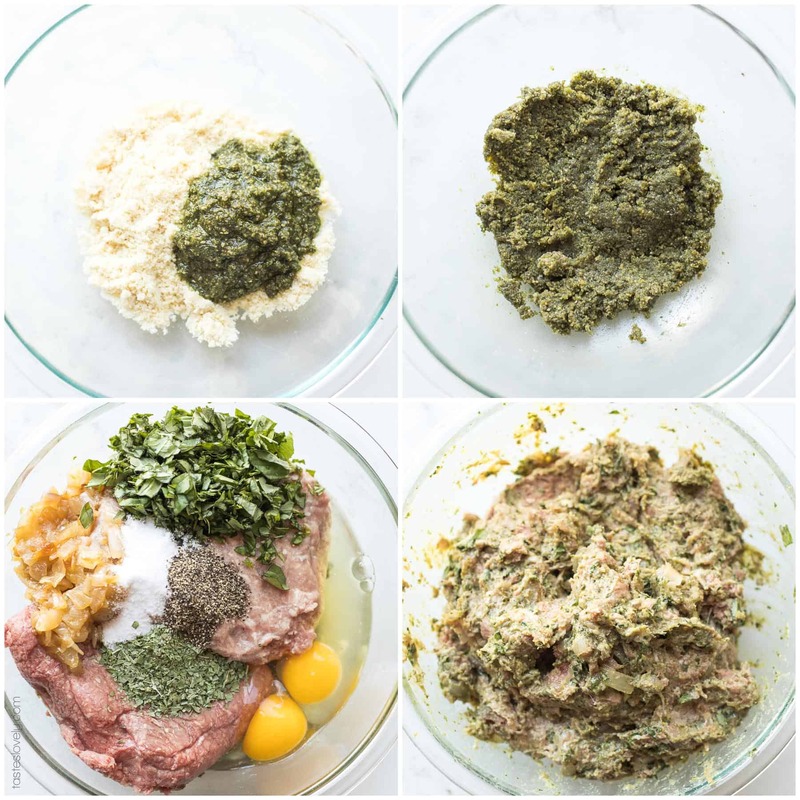 In a large mixing bowl, combine the almond flour and pesto. Stir and set aside while it absorbs the liquid. Heat a medium size skillet over medium heat. Add olive oil, onions, garlic and a pinch of salt & pepper. Cook, stirring occasionally, until the onions are soft and turning golden brown, about 10-15 minutes. In the same large mixing bowl that has the almond flour and pesto, add the cooked onions & garlic, ground beef, ground pork, 2 eggs, chopped fresh basil, dried basil, salt and pepper. Use a spatula or hands to mix until completely combined. Use a large cookie scoop (or measure out 3 tablespoons) to scoop out meatballs, and use hands to roll into balls. 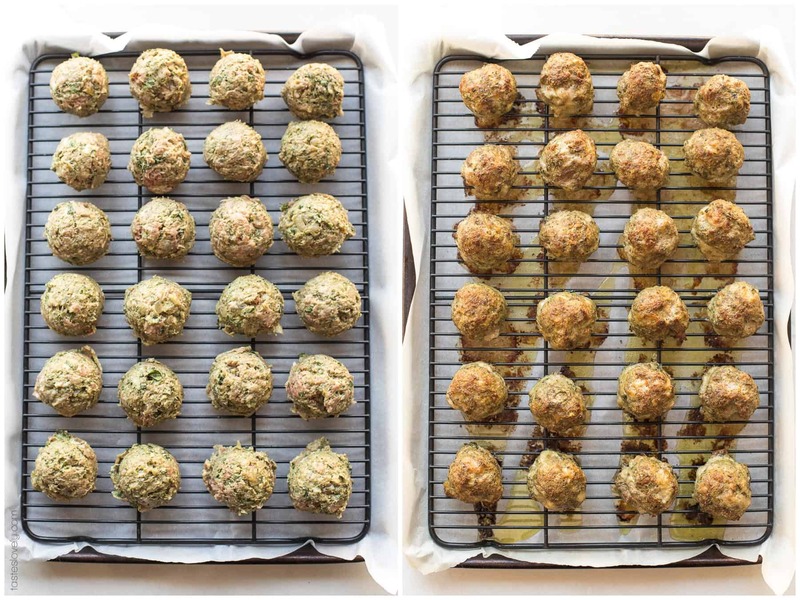 Place meatballs on wire baking sheet. Will make 23-24 meatballs. Bake the meatballs in the oven for 25-30 minutes, or until golden brown. Serve immediately while warm, topped with pesto. Delicious on top of zucchini noodles or roasted spaghetti squash. These meatballs freeze beautifully! After baking, allow the meatballs to cool completely, then freeze the baked meatballs in a freezer ziptop bag for up to 6 months. When ready to reheat, bake the frozen meatballs on a rimmed baking sheet in a 350ºF oven for 15-20 minutes until heated through.